With the first week almost over, I thought I'd offer my personal perspective so far. Television coverage has been inexplicably bad, as noted by The Chronicle. Now, I happen to like beach volleyball. It's a sport I'm pretty good at, from experience with tennis and regular volleyball. I have this fantasy of wangling my way onto the Latvian team by way of my paternal grandmother. So I don't mind that coverage. But I do agree that other sports like table tennis, and non-US athletes, have gotten the least coverage ever. But I can't let the piss-poor tennis coverage pass. We scanned the TV listings and Tivo'ed sometimes 8-12 hours per day, any block on any channel that mentioned "tennis" in its program summary. We didn't get any tennis the first 3 days, and after that only a few points here and there, no charts showing the draws or results, hardly even any match highlights. It was over a day between the time we heard that James Blake lost in the semifinals, to the point we heard who he had lost to, i.e. the other player besides Nadal who would be in the gold-medal match. Couldn't find the men's semifinals anywhere. On other occasions when big tennis events are covered on more than one channel simultaneously, we've always been able to pick up the pattern after the first day. One channel has highlights, another jumps around while matches are on live, a certain time slot has the best match of the day, any remaining American will get a night match, and so on. This time, not a glimmer of any pattern. And online updates are a Catch-22. Because we're a day or so behind with the watching, it's no good reading the tennis news or going to the Olympic site for the draw, that would just give away matches that we forlornly imagine might be in some block we haven't seen yet. The most interesting tennis story for me from the Olympics is Roger Federer. I'm concerned by his lack of confidence lately, and I didn't think he played very well in the Wimbledon final, despite all the "best match of all time" blather. His loss to Blake demonstrated that he didn't read my blog post about things to learn from Nadal. He didn't change up the speed when the rallies got hard and flat as Blake prefers. When he ran around his backhand, his forehands were either predictable inside-out ones, or he missed the occasional down-the-line attempt or didn't put anything on it. Winning the doubles gold may help Federer get back on track. In doubles, you have to keep things positive with your partner all the time. Instead of hanging your head after you (or your partner) make a bad shot, you have to cultivate short-term memory loss. If the opponents win a point with a good play, you can still give your partner a fist bump or low five to acknowledge that you're following the right strategy. Serving in doubles involves changing positions, going for extra angle, and getting a high percentage of first serves -- all things that have gone wrong for a game or two during each of Federer's recent losses. The net play forces you to hit volleys in crunch situations, unlike the Wimbledon final where Roger had too many desperation volleys in the fifth set, and even ceded the net to Rafa over the last couple of games. And doing it for Queen and Country, and mentoring a less-experienced player through a bunch of tough matches, may help Roger in singles when he needs to visualize the positives of getting through a close match, not just the negatives like "shouldn't lose to this guy", "there goes the #1 ranking", "Rafa made a comeback, maybe this guy will too", and so on. Every time I hear the word "metadata", I cringe a little bit. It's one of these simple intuitive notions that everyone has experience with, but in the tech world it's loaded up with so much jargon that it gets lost in the clouds. With iTunes, you might be familiar with metadata as the editable Song, Artist, Album, etc. fields on the Info panel when you do File -> Get Info. This is information about each song that's stored inside the song file. There's also metadata that's outside the file itself, like what directory it's in or even the filename. You can move the file around and rename it, and it's still the same song. It just might be harder to find unless you name it and file it in a logical way. 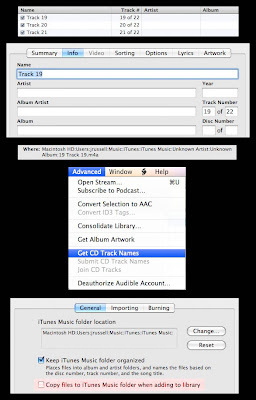 When you import songs into iTunes, this "inside/outside" distinction can be important if the songs come from a source other than songs ripped from a CD by iTunes. For example, maybe the songs have names like "01 - Great Song.mp3" in a folder "My Favorite Band/Their Best Album". You drag a bunch of songs like that into iTunes, only to discover that the fields in the "Get Info" panel are all blank, and now the song is filed in your iTunes Music folder under "Unknown Artist/Unknown Album". How do you avoid that happening? The key is to make sure that all the information -- the metadata -- that you know about each song gets stored inside the song file before you let iTunes start messing around with the file names and locations. Let's say you are ripping a CD out in the woods or in a plane, someplace with no Internet access so iTunes can't automatically retrieve the track info. If it's a well-known CD, you can probably retrieve the track info later, so no worries. But if it's an indie release, an import, or just something obscure, you might be forever left with some files named "Track 20" and so on and nothing else to go by. When you're ripping or importing a bunch of songs all from the same artist, import them into a playlist named for the artist and album. That way, even if no other information is available, you can go back to that playlist, select all the songs, and in the "Get Info" dialog, fill in the same artist, album, genre, year, "Disc n of n", and so on for all the songs at once. If you're importing several albums by the same artist, you can make a separate playlist for each one. Perhaps make an iTunes folder named for the artist, then separate playlists underneath named for each album. Let's say you're importing songs that weren't created by iTunes, say a fanboy collection of bootlegs that are arranged in some special hierarchy, like one folder named "1972" with a bunch of concerts from the same tour, then another one "1975" and so on. You want to preserve the information from this hierarchy so you can fill in the year etc. if those fields aren't filled in in the "Get Info" panel. This situation calls for a more elaborate process. Make sure that the setting under Preferences -> Advanced -> General, "Copy files to iTunes Music folder when adding to library" is turned off. Then you can drag the files into iTunes and the Get Info -> Summary panel will still show you the full folder path of the file. You can examine the files to see which info fields are filled in, which ones you need to fill in yourself, and you can refer to the Summary panel if the track number, year, album, etc. aren't available in the title of the song. When you're done with this initial step, remove the files from your iTunes library -- select the songs and hit Delete within the main Music part of the library, or Alt-Delete within a playlist. Because the songs aren't actually underneath the iTunes Music folder, iTunes won't ask about moving the original files to the trash. They'll stay exactly where they are, just now with some extra metadata inside the actual files. Now you can go back to Preferences and turn the "Copy files..." setting back on. Import the files again, and now they'll go into the iTunes Music folder under the familiar "Artist/Album" folder path. Because you've already filled in these info fields for all the songs, you don't have to worry about them ending up under "Unknown Artist/Unknown Album". In this example, we see some files that I really did rip way out in the wilderness with no Internet access. Learn from my mistake! First, we see the completely unhelpful song names, with no artist or album filled in. Because I just imported them into my main music library, instead of dragging into a descriptively named playlist, there's no clue I can use to go back and fill in the info. The Get Info -> Summary panel is no help, it shows me they're filed under "Unknown Artist/Unknown Album". I tried using the menu item Advanced -> Get CD Track names, but the CD was too obscure , it isn't listed in the Internet CD Database. If I had imported existing MP3s from a folder named after some combination of band, album, year, etc., I could avoid the "Unknown Artist/Unknown Album" mystery by unchecking the "Copy files..." option in Preferences -> Advanced -> General, at least until I had filled in all the other fields. Then I could turn on that option, remove the files from the library, and re-import them to file them in a central, easy to find location. When you import songs that have all the info encoded into the filename, such as "1. 1991 - One-Hit Wonder - Flash in the Pan - Only Album.mp3", it doesn't have to be tedious to retype all these items in the Get Info fields. 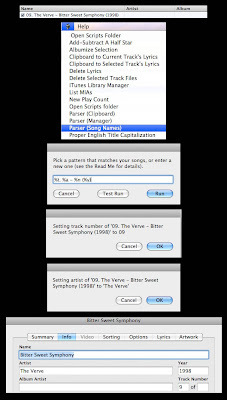 For users of iTunes on the Mac, there's an Applescript called TrackParser that can pull out these extra pieces of information from the song name, fill them into the appropriate fields, and strip them out of the song name field. In this example, we start with a song that has all the info packed into the song name. After running the TrackParser script, we construct a pattern using placeholders for the important parts, and matching the punctuation and spacing of the remainder of the song name. First, we click the "Test Run" button to see whether the pattern will pull out the right pieces of information and put them in the right fields; we keep clicking OK until we're satisfied that the pattern is accurate, then click Cancel to end the test run. We go through the same steps again, and the same pattern is still filled in. Clicking Run this time makes the script really fill in the other fields and trim the extra info out of the song name. In the end, the Get Info panel reflects the right song information. Tennis - What Can a Right-Hander Learn from Nadal? Chatting with my opponent during a match, we remarked that (as right-handers) we couldn't take a whole lot from Nadal's serving or positioning strategy. And as people with normal shoulders, we couldn't figure out how he does that heavy topspin forehand motion. But, even so, there are some things that a right-hander can take away from the Nadal game. Nadal's opponents usually know his game plan in advance. He has his favorite shots, and attributes like fitness and concentration, that he just figures are better than the opponent's. So it doesn't matter if the other guy is ready for what's coming, Rafa will stick to the plan knowing that he has an excellent chance if the match is played on his terms. You can do the same, whether your strength is the volley, consistency, angles, speed, and so on. Clay-court positioning is way back behind the baseline. Why is this so effective? Just try hitting some balls from that position, next time you're picking up near the fence after a drill. You can fire line drives as hard as you like, with little worry that they'll go out. So next time your opponent hits something deep and/or high, retreat a few steps, bang an offensive shot someplace they don't expect, then move in and take control of the baseline again. Ever notice how every left-hander has a heavy spin serve in the ad court that goes to your backhand? That's perfect for the left-hander because (a) the backhand tends to be the weak side, and (b) the ad court is where you serve most game-winning or game-saving points. A right-hander would be serving those sliders and kickers in the deuce court. Well, why not work on that serve anyway? Even though it's directed to most opponents' forehands, it can still push them way off the court and set you up for an easy putaway on the next shot. Rafa has more options than most players when he runs around his backhand. In addition to the inside-out forehand (most players' favorite choice from that position), he'll often hit a heavy topspin forehand down the line, with plenty of margin for error. Not intended to be an outright winner, just to surprise the opponent, pull them out of their normal position, and prompt a weak response that makes the next shot much easier to put away. I find this shot is so rare for right-handers, they usually pull it into the alley when they attempt it. Practice this shot -- down-the-line forehands from your backhand corner -- with a little extra height and well inside the sideline. You'll mess up opponents who expect every forehand from that spot to be inside-out, and you're pretty much guaranteed that your next shot will be a forehand too. While you may not be a natural right-hander who plays tennis left-handed, like Nadal, you can take advantage of your off-arm even if you don't have a powerful two-handed backhand. When cradling the racquet in the ready position between points, support it entirely by the left hand on the throat. The racquet is only a few ounces, and you only need a few seconds before the next point starts, but by the third set of a long match, the energy savings can really add up to keep your racquet arm fresh. Rafa's Wimbledon win demonstrated some new shots, particularly the one-handed slice backhand. Take note! Even a player renowned for his speed is willing to slow down the pace when he's out of position or the ball is too low and hard to hit an aggressive shot. You can stay in lots of points with a deep slice, a defensive looper, or an off-speed ball. Just stay ready to go back on offense once this tactic disrupts your opponent's rhythm or wears out their patience.